via Jakarta Post, 25 March 2018: Travel links from the new Yogyakarta airport to to attractions like Borobudur to be improved. The Yogyakarta provincial administration will improve a number of travel destinations located between the new Yogyakarta International Airport in Kulon Progo and Borobudur temple in Magelang, Central Java. Former US President Obama visited Borobudur last week with much fanfare, and it was nice of him to leave a positive note about the continued preservation of the site. Moreover, Obama also calls for the preservation of the 9th-century Buddhist temple. A new study centre on the archaeology of volcanoes will be built in Yogyakarta, to study the effects of the eruptions of Mount Merapi on local communities. The government is set to build a volcano archaeology study center from which people can get information about the history of temples buried by Mount Merapi in Yogyakarta, a culture conservation official has said. “People can learn from the study center that Mt. Merapi’s eruptions have had an impact on local communities since thousands of years ago,” Wahyu Astuti, the head of cultural heritage protection, development and exploitation division at the Cultural Heritage Preservation Agency (BPCB) Yogyakarta, told thejakartapost.com, on Tuesday. She said the government planned to build the volcano archaeology study center on the Kedulan Temple complex in Kedulan village, Tirtomartani, Sleman. 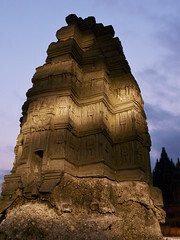 Kedulan Temple, a Hindu temple which is around 7 meters high and covers an area of 144 square meters, was built around 9 AD. The temple which has three ‘perwara’ or literary means ‘companion’ temples on its east side is located around 25 kilometers in southern side of Mt.Merapi. A feature on the temple of Ratu Boko, outside of Yogyakarta, that is favoured by photogaphers because it overlooks Prambanan and Mount Merapi. This is a second call for papers for the upcoming conference Museum of Our Own: In Search of Local Museology in Asia on running 18-20 November in Yogyakarta, Indonesia. List of topics and convenors after the jump. A case where 80 gold artefacts were stolen from a museum in Yogyakarta have been referred to Interpol, as it is believed that the artefacts have been smuggled out of the country and sold. The Star’s travel feature on the two must-visit places when in Yogyakarta – Prambanan and Borobudur. Gold artefacts dating from the 8th and 9th centuries have been stolen from a museum in Yogyakarta in Java.